Maybe presidents should be paid by the hour. Save us some money. Meanwhile, if you’ll excuse me, I’m gonna take some “executive time”. In Trump's case it's more like, Hail to the Chode. Gonna talk to my boss about getting some "executive time" most of the day so I can be creative. “She’ll go home, she’ll take a nap for four or five hours, and she’ll come back. No naps for Trump, no naps. I don’t take naps. We don’t have time,” Trump said. "Damn. Y'all murdered the sh*t out that mutherf***er"
Ha. 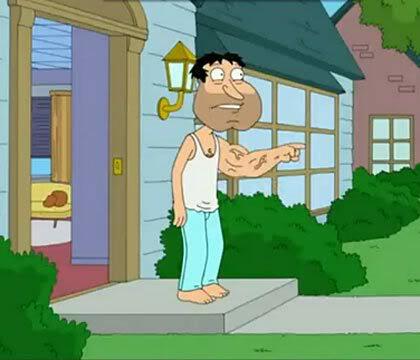 Quagmire is a “Lefty”. Another leak. Trump very low energy and spends 50% of his time goofing off. He inherited $400 million from daddy. Yet another silver spoon slacker. Stage 2. The dawn of shoulder to shoulder racing. If going to Cincinnati try not to breathe through your nose. What's on the cotton balls in the nose?